Talk about a party stopper! For the White Chocolate Bubble Wrap and Curls: In a medium bowl add the 16 ounces of the chopped white chocolate and microwave in 15-second intervals stirring until smooth. Spread the white chocolate onto the raised side of the bubble wrap in an even layer. Wrap the bubble wrap chocolate side down around the cheesecake and allow to set, about 5 minutes. In a small bowl add the jam and lime zest and mix to combine. Spread onto the top of the cheesecake. 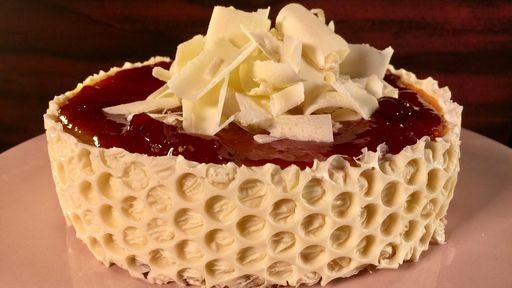 Using a vegetable peeler, shave strips of chocolate off the remaining 4-ounce block of white chocolate and scatter on top of cheesecake. Carefully peel the bubble wrap off of the chocolate and discard. Tip: Slightly warm your chocolate by setting it in a warm place, for easier peeling!